Don Herman Scheel, 65, of Silverton, Idaho, passed away August 24, 2018 at the St. Patrick Hospital of Missoula, Montana, due to a motorcycle accident. He was born February 22, 1953 in Wallace, Idaho; Don was the son of Henry and Julia (Lapp) Scheel. Don attended and graduated from the Mullan High School of Mullan, Idaho in 1971. He then proudly served in the U.S. Army. Don married Mitzi Reed on June 19, 1976 at the Lutheran Church in Mullan. Don had first worked for the Bunker Hill Mining Company as a miner; he then worked as a freight delivery truck driver in Anchorage, Alaska. Don next served as a supervisor and plant manager at Spunstrand of Wallace and lastly he had worked at the Mill of the Lucky Friday Mine. Don was a member of local Harley Davidson clubs. 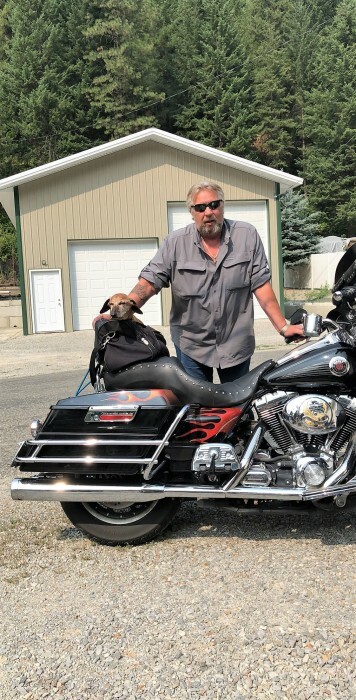 He loved and enjoyed his family especially his grandchildren; Don also loved riding his motorcycle, hunting, camping and enjoying the great outdoors. Don is survived by his wife Mitzi Scheel of Silverton; one daughter Brandi (Greg) McCollim of Cheney, Washington; two grandchildren Colbyn and Blakeli McCollim; his mother Julia Scheel of Wallace, Idaho; one brother Carl (Tammy) Scheel of Mullan; three sisters Donna (Paul) Welcher of Mullan, Cynthia Reed of Port Townsend, Washington and Dianne Scheel of Post Falls, Idaho; his niece and nephews Tanisha Gloyn, Shane Scheel and Justin Scheel; he is also survived by three great-nieces and one great-nephew. Don was preceded in death by his father. A Celebration of Don’s Life will be held on Saturday, May 4, 2019 at 1:00 P.M. at the Morning Club of Mullan, Idaho with Pastor Art Fleming officiating. There will be a luncheon for family and friends following the Celebration; this will be potluck and everyone is welcome. The family suggests that memorials may be made to the charity of the Donor’s choice. SHOSHONE FUNERAL SERVICES & CREMATORY KELLOGG, IDAHO is entrusted with services.